Plot Summary: After fourteen years in the Major League Baseball, Goro returns to Japan because of a surgery that forced him to quit his life as a pitcher. He is determined to continue playing the game, but now as a fielder in his home country. 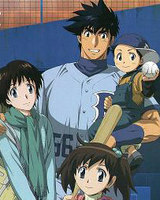 Trouble arises as Izumi, his eldest daughter, is unable to understand his actions.